I’ve eaten at Nobu in London way back in 2003 when it was the hottest ticket in town, and frankly don’t remember much about the food – notwithstanding the lychee martinis my friend and I were piling down, but we were so busy gossiping about our latest TV-land exploits (or more importantly the exploits of those we’d been working with) that the food completely passed me by. I take this as a sign that it was rather pleasant but not jaw-dropping, and hence haven’t been back since. We thought we’d give it a go here as we wanted to compare and contrast against the other Japanese restaurants we like. Some people will cry foul now because Nobu is apparently a fusion restaurant. But ultimately it relies on its Japanese-ness to bring the crowds in. The upshot is that I won’t be going back to this edition of Nobu either. Food: We had a set menu of 7-8 courses and apart from the wagyu beef (which at the end of the day is their signature dish), there was nothing of note. 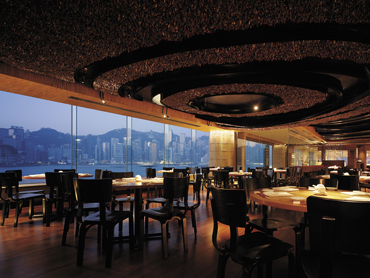 The marker of quality of Japanese restaurants – the fish – wasn’t any better quality or fresher than any number of other good restaurants in Hong Kong, which was disappointing because Nobu positions itself as something above and beyond, which in our experience, it wasn’t. Drinks: Good wine and sake list, nice selection of beers, everything you expect. Ambience: A lot of hype was built around the design of this restaurant, and it is cool. It doesn’t blow me away, but has it’s little quirks and features that makes it an interesting place to look at, but you really know that you are in a hotel restaurant. Also, they do pack you in and there isn’t a lot of room between tables in the section where we sat. Service: The service was efficient and subtle. What you’d expect in a 5* hotel (although nothing in my opinion surpasses that of the Mandarin Oriental in this town). Price: The set menu was $2888 per head, and we spent another $500 on 2 carafe’s of sake and a 1/2l bottle of water as they refused to fill our glasses from the tap. I came away thinking that is was an expensive, brand name restaurant that didn’t live up to the hype. I’d go to Kiyotaki or Jun over Nobu every day of the week unless I was desperate for Wagyu beef, and then I think I’d look for somewhere new first before going back here (in fact I’d probably go across the corridor to The Steak House…).